Dogg Haus and Taco Bar MKE. Photo by Dave Reid. Diners in Cathedral Square can expect a new option for tacos in the coming weeks. 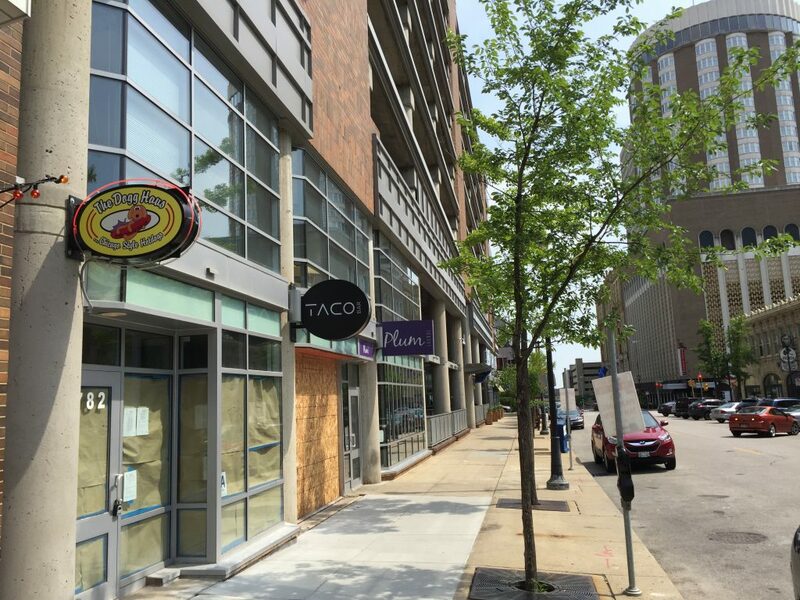 Taco Bar MKE will open at 782 N. Jefferson St. The new Mexican restaurant is one half of a dual-branded concept for the space, which will also include Dogg Haus. Both businesses are owned by Mazen Muna, who also owns the adjacent Plum Lounge at 780 N. Jefferson St.
With his new venture, Muna hopes to bring quality, accessible and affordable food to the neighborhood from lunch time until late at night. “I always felt that particular area of the block could use a little boost of energy and life,” said Muna in an interview with Urban Milwaukee. The bar and restaurant will serve lunch, dinner, happy hour and late night food, with sit-down and to-go options available for most of the day. Muna plans on serving orders only in to-go boxes after a certain time, possibly midnight or 1 a.m. While the restaurant was originally expected to be open by June 14, the official opening will take place in three weeks to a month. Inspections are still being finalized and construction on the space was completed on June 15. Muna leased the space in February, following the January closure of the space’s longtime occupant, the Peking House. The 5,200-square-foot facility was then renovated to make room for both businesses. The larger space is intended to help accommodate late-night and lunch-hour crowds experienced at the former Dogg Haus location (790 N. Jefferson St), which was only 850 square feet. Taco Bar MKE will be more modern than a traditional taco restaurant. Muna described the new space as warm, clean and contemporary with straight lines. Both restaurants will share a single kitchen, which is large enough to provide a level of separation between the two. The cocktail program will be overseen by JC Cunningham, who has 20 years of mixology experience and serves as Plum Lounge’s bar manager. Cunningham is currently planning on two to four different frozen margaritas, possibly including a banana daiquiri flavor. A fully-stocked bar will accompany a 1,000-pound steel “tequila tree” built by Milwaukee Wood and Iron. Thirty-two slots for 32 different bottles of tequila will be placed in different spots on the tree, with some being high enough to require a bartender to use a ladder. The restaurant will also have a NanaWall separating indoor and outdoor seating. The sliding glass front, along with the patio seating, will be open during summer months. Muna is still hashing out definitive operating hours, but expects Taco Bar MKE to be open 11 a.m. through dinnertime Monday, and 11 a.m. to 3 or 3:30 a.m. Tuesday to Saturday. The bar and restaurant will be closed on Sundays, with the possibility of opening for special occasions such as nearby festivals.